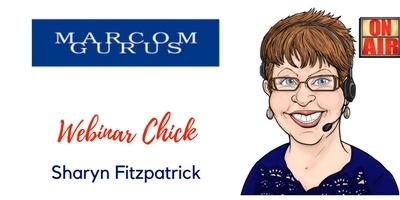 Webinar Best Practices from Sharyn Fitzpatrick of Marcom Gurus - Gordon L. Johnson, Inc.
Webinars are a big part of all of our marketing plans, but few do them as well as Sharyn Fitzpatrick of Marcom Gurus. She helps companies run great webinars and has managed over 2000, so she’s seen just about everything. 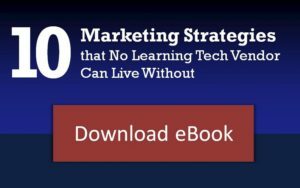 I wanted to learn from Sharyn how to create a great webinar and how to avoid turning it into an expensive learning experience. Q: What are some of the keys to a successful webinar? Sharyn: Expect the unexpected and plan for it. Allow four to six weeks from conception to completion. 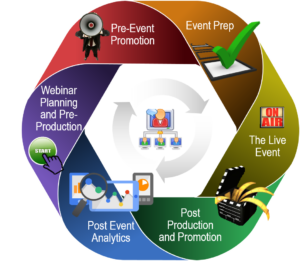 With so many moving parts, you need to plan your webinars as a production. Start with the basics – who is speaking, the topic, and an abstract of the webinar content. Then, think about the whole process and lay it out in a document that will be your production guide for each event. What happens both pre- and post-event? How are you going to follow up withleads? I use a template for each of my clients to keep all the creative we need like logos, speaker head shots, content for the webinar platform, post-webinar descriptions, and follow-up messages. Don’t forget to use the webinar recording as an on-demand asset. You can get a lot of mileage out of the recording and sometimes even more than the actual live event. It also helps a lot with SEO. Q: What are some of the gotchas to look out for? Uninspiring and untrained speakers. Make sure you’ve heard them speak so you can gauge how much help they will need. Q: For a company who’s never done a webinar, how should they get started? Q: How far in advance should you send invitations? Sharyn: The rule of thumb was three to four weeks but that is often too far away. It really depends on your audience. An eLearning/training audience will plan far enough in advance but a technical audience likes shorter time frame. We have seen this over and over again reflected in attendance numbers. Always send out reminder emails, so they don’t forget what they signed up for. If they signed up for a webinar more than three weeks in advance, then send out a five or seven-day reminder. If it is less than two weeks, then send out a 24-hour reminder. Usually, a one hour or 20-minute reminder also works. Send a webinar invitation to your target list the day before the webinar to encourage them to register. Use “Last Chance” in the subject line. With our busy schedules, we may not know if a webinar will fit our schedule, so registering the day before will grow your numbers. Q: How much should you budget for a webinar and how can you reduce costs without sacrificing quality? Sharyn: The technology and event management costs range from $2000 and up. Technology costs for 100 attendees cost X and that cost goes up when you have a large registration. You do get what you pay for. Since most webinars are for lead generation, you want to make sure you choose a quality platform that has a history of delivering problem-free events to audiences of your target size. Marketing also plays a big factor in the cost. The average cost for a list of 5,000 names is $2500. You can control your budget by getting creative with your plans – do more with less. Trade for names. If you partner with someone, use their names for audience development. Build up your own lists so you just have to pay for email services, not names. Q: What’s the best way to market a webinar? Sharyn: Use an internal list, if you have enough names. Prospects who have heard of you will respond the best. Use a text-only email, not HTML. Banner ads and announcement in industry eNewsletters also draw attendance. Create and implement a social media strategy. Hashtags such as #Webinars #eLearning could drive more registrations. Q: Should you include partners to defray costs and handle some of the presentation? Sharyn: Only if you are willing to give them a share of the spotlight and they agree to play by your rules. Q: What webinar platforms would you recommend? Sharyn: It is really more than just a webinar platform. It is also the event management capabilities they offer. Understand whether they handle registration, confirmation emails, reminder emails, post-event notifications, and reporting for lead generation. Many of the platforms offer a trial. Take them for a test drive! It really helps to decide which platform fits your budget and your program. I use all of them but the one I recommend the most is GoToWebinar. It is the most reliable, even with shortcomings such as limited branding and customization. The learning curve to set up and run a webinar is short and easy. I love ON24 but in order to customize the branding, you have to know how to use HTML coding. Q: How can people reach you if they need help with their webinars?